State and federal regulators are cracking down on waste and fraud in the unemployment insurance system, abuses that have hit record levels as jobless claims surge in a weak economy. In the 12 months through March, the overpayment rate was 11.6% — more than $1 for every $9 paid out, Labor Department figures show. That's up from the 12 months ending in June 2010, when a record $16.5 billion, or 10.6% of the $156 billion in jobless benefits disbursed to Americans, should not have been paid, according to the department. The overpayment rate was 9.6% in fiscal 2009 and 9.2% in 2008. Officials partly blame soaring unemployment, which forced state officials to use fraud-prevention workers to help handle an unprecedented wave of claims. "They were using every person they could find," says Gay Gilbert, Labor's unemployment insurance administrator. Lawmakers say excess payments could go to legitimate jobless claims and help keep state unemployment trust funds solvent. 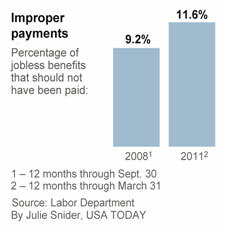 About 9.3 million Americans receive benefits. "These dollars lost to overpayment and fraud could instead help individuals and families confront these tough economic times," Senate Finance Committee Chairman Max Baucus, D-Mont., said at a recent congressional hearing. The main reason for overpayments is that some workers continue to receive unemployment checks even after they land a new job. Another problem is that many employers fail to adequately provide state officials the reason an employee left the company so the worker's eligibility can be determined. Also, some workers receive benefits even when they don't comply with state job search requirements. •A national directory of new hires lets states identify workers still receiving benefits even after they get a new job. By the end of the year, all states must use the directory. Labor officials also plan to provide funds so overtaxed states can more frequently follow up and collect overpayments from scofflaws. •A new computer system makes it easier for employers to report why workers left their jobs. Only a few states use it but the Labor Department is providing funds to encourage wider adoption. •New rules let states recover improperly paid benefits from U.S. income tax refunds. The department also has proposed legislation that would require states to impose penalties of at least 15% of excess payments on workers. In addition, software from On Point Technology automatically notifies employers and workers when overpayments are detected and even contacts prosecutors if workers don't pay it back.